With the new year coming up I have goals on the brain. I went into my craft room yesterday and counted about 10 crafty projects that I’ve started but just haven’t finished! Please tell me I’m not the only one guilty of this. I’ve seen many resolution pages and bucket lists, but I wanted to do something a little different. I started it. I finally want to finish it. 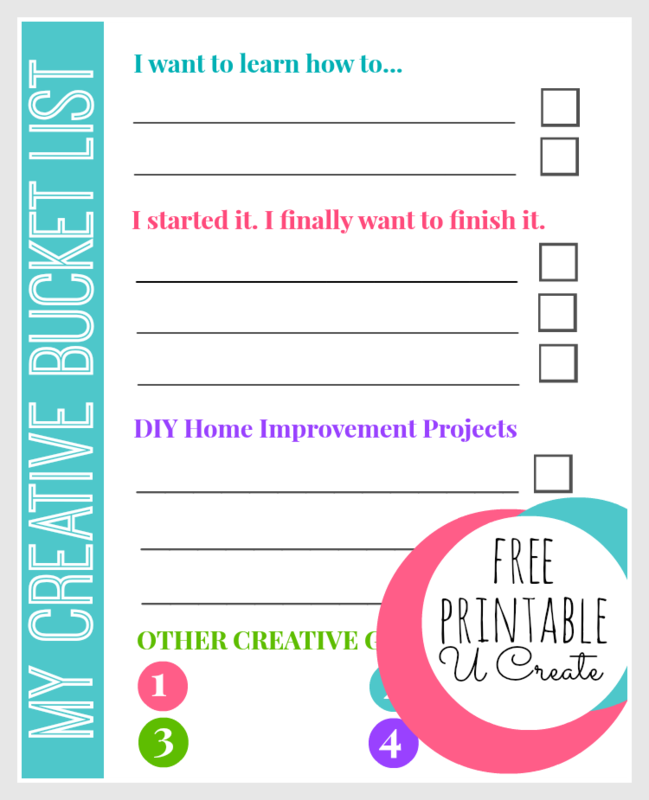 Here’s the free My Creative Bucket List download! You are not the only one! I am in the same boat. Last year I set a goal to finish some of my UFOs floating around. While I didn’t get them all done, I certainly got a chunk of them finished up. It’s a great feeling! Good luck! And thanks for sharing the printable! Thank you very much for the creative bucket list download. i have so many unfinished projects, you have no Idea. I hope this helps me keep focused. LOVE the printable! Thanks for sharing!